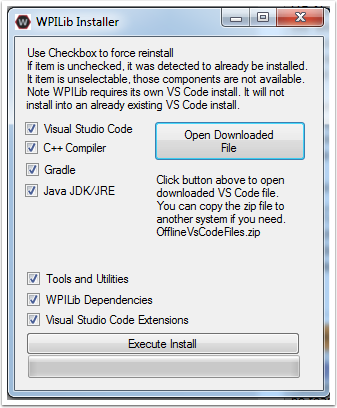 Install instructions for C++ and Java development tools are provided below. Click the arrow to expand the instructions for your specific platform. Download the appropriate installer for your Windows installation (32 bit or 64 bit) from GitHub. If you're not sure, open the Control Panel -> System to check. Double click on the installer to run it. If you see any Security warnings, click Run (Windows 7) or More Info->Run Anyway (Windows 8+). 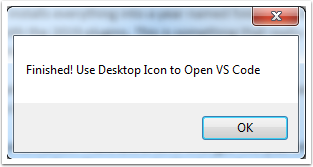 Choose whether to install for All Users on the machine or the Current User. The All Users option requires Admin privileges, but installs in a way that is accessible to all user accounts, the Current User install is only accessible from the account it is installed from. If you select All Users, you will need to accept the security prompt that appears. 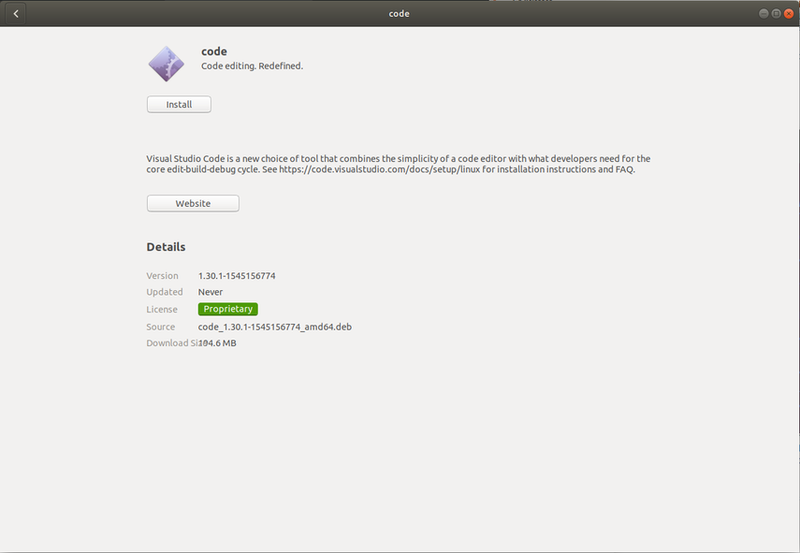 For licensing reasons, the installer cannot contain the VSCode installer bundled in. 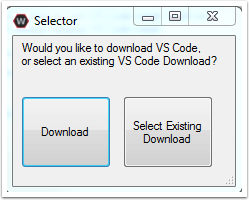 Click Select/Download VSCode to either Download the VSCode installer or select a pre-downloaded copy. If you intend to install on other machines without internet connections, after the download completes, you can click Open Downloaded File to be taken to the zip file on the file system to copy along with the Offline Installer. 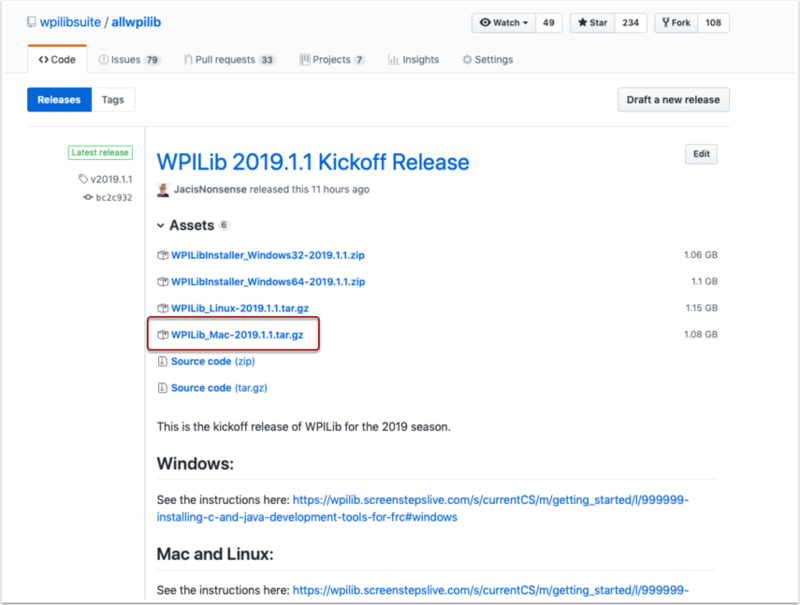 Make sure all checkboxes are checked (unless you have already installed 2019 WPILib software on this machine and the software unchecked them automatically), then click Execute Install. 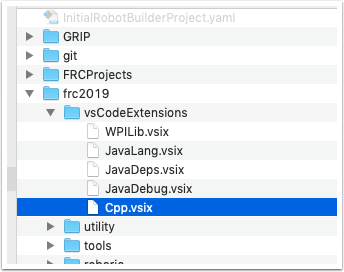 Visual Studio Code - The supported IDE for 2019 robot code development. The offline installer sets up a separate copy of VSCode for WPILib development, even if you already have VSCode on your machine. This is done because some of the settings that make the WPILib setup work may break existing workflows if you use VSCode for other projects. WPILib Dependencies - OpenCV, etc. 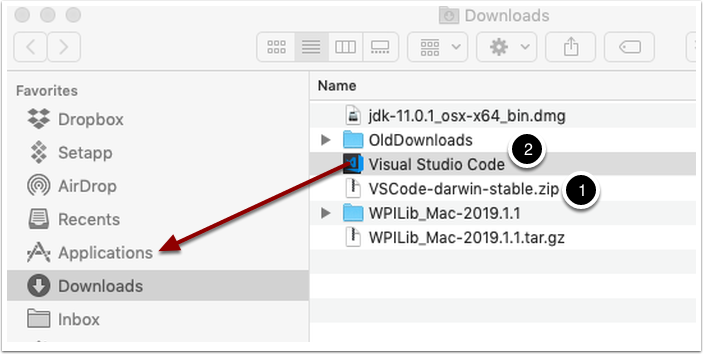 The Offline Installer also installs a Desktop Shortcut to the WPILib copy of VSCode and sets up a command shortcut so this copy of VSCode can be opened from the command line using the command "frccode2019"
Both of these reference the specific year as the WPIlib C++\Java tools will now support side-by-side installs of multiple environments from different seasons. 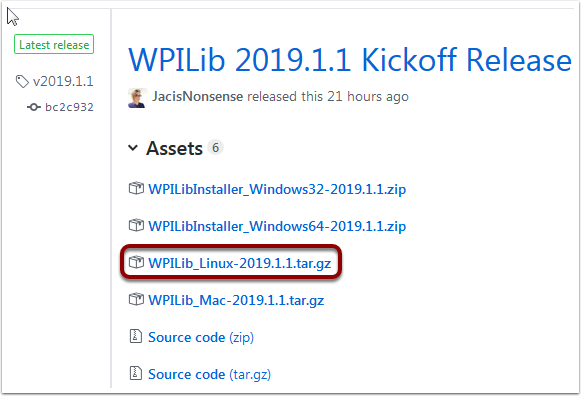 When the installer completes, you will now be able to open and use the WPILib version of VSCode. If you are using any 3rd party libraries, you will still need to install those separately before using them in robot code. The tools (except the Driver Station and the roboRIO Imaging Tool) will run natively on a Mac. Note: if you have the alpha release of VSCode for FRC installed, you should uninstall it before proceeding or create a new VSCode install. Failing to do this will have both versions installed at the same time causing things to not operate properly. To install it follow these steps. VSCode is the IDE (Integrated Development Environment) that is used for 2019 and beyond. It needs to be installed on any development computer. It can be downloaded here: https://code.visualstudio.com. Once downloaded, double-click on the zip file to expand it and copy the new file: "Visual Studio Code" to the Applications folder (2). Download the software release by navigating to this page: https://github.com/wpilibsuite/allwpilib/releases and downloading the Mac release. 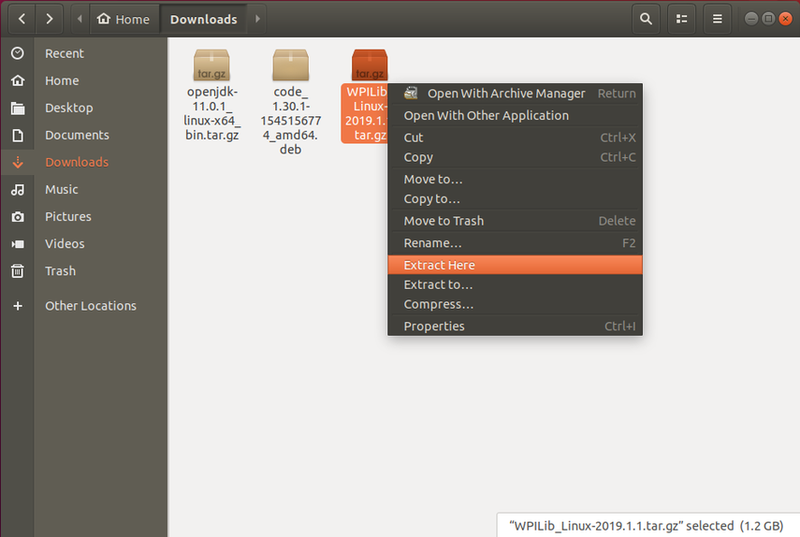 Unzip and untar the file by looking at the file in the explorer and double-clicking on it, once or twice to unzip (remove the .gz extension) and again to untar it (remove the .tar extension). 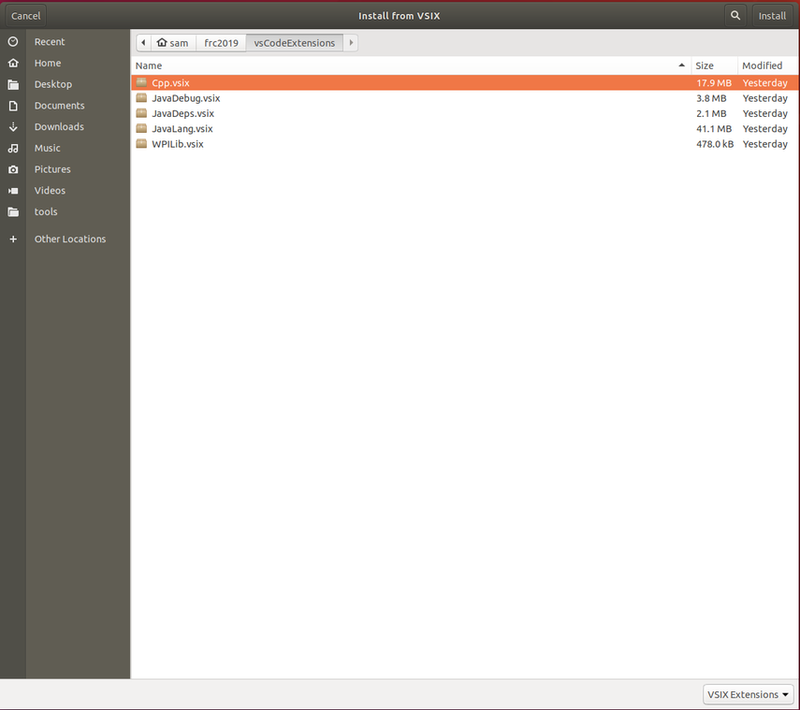 When finished it should like like the folder shown below. 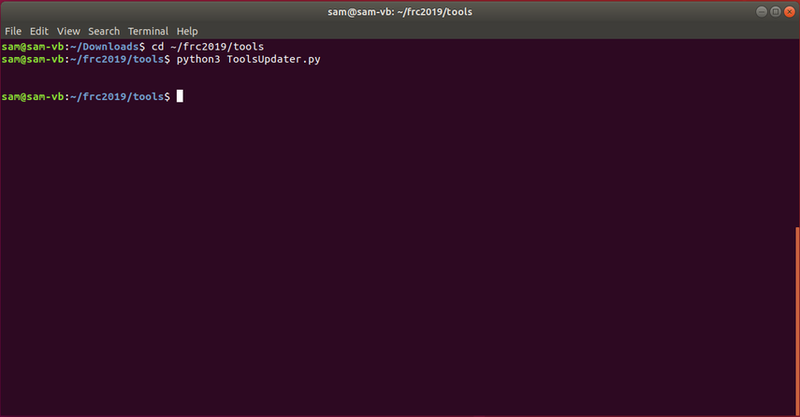 Using Finder (or command line) copy the contents of the folder to a new folder in your home directory, ~/frc2019 as shown below. Before using VSCode for WPILib development there are a number of extensions that need to be installed. Start up VSCode and type the shortcut Cmd-Shift-P to bring up the list of commands available. Start typing "Install from VSIX into the search box. Choose that command. In the file selection box select Cpp.vsix. Right-click on the downloaded archive, click "Extract Here"
Control+Shift+P to bring up the command palette, type "Install from VSIX"